The biannual world tour of tribal lands – Alaska to New Zealand via Arizona, Africa and Taiwan – organised by auctioneer Will Hobbs at Woolley & Wallis (25% buyer’s premium) offered a global view of what is an active, if often unpredictable, field. The 860-lot sale at the Salisbury rooms on September 19, enjoyed a 75% success rate and hammered £375,000. For a number of Americans, including two who flew over to be at the sale, a major draw was the 180-lot collection of Ian West, a published authority on native American culture who had his own small museum in Sussex before his death at 91 in 2015. Much of the material was 20th century which he had bought from reservations. Buyers jibbed at the few pieces with four-figure estimates, but it mostly sold well with more than a dozen tribes featured. Examples included a Sioux horn and quill spoon at £650, a Plains Indians canvas vest with coloured glass, steel, brass and buckskin beads at £700 and an Apache buckskin-covered stone-head club at a double-estimate £300. 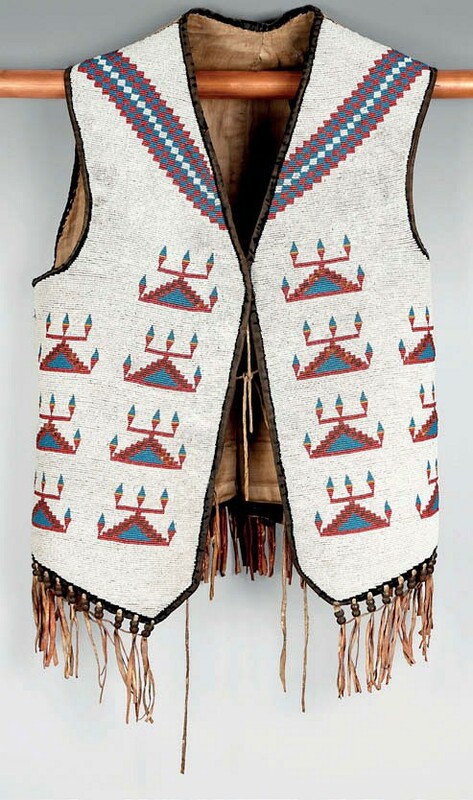 Plains Indian beaded vest – £700. Inuit marine ivory carvings benefit from a sensible detour around the draconian US ivory laws. All carved and scrimshaw work by an Alaskan native is permitted to be bought and sold in the country. Best example at Salisbury was a 19th century carving of a sea otter – an animal with semi-spiritual links in Inuit culture – lying on its back with its paws to its mouth. Estimated at £1000-1500, the 3in (8cm) long animal, a type associated with the Aleutian Islands, went to a Belgian dealer at £7000. The auctioneers had sold another example in June 2014 which also made £7000. On to West Africa and, in particular a number of Yoruba ibejis. These figures were commissioned by mothers of twins, one of which has died. The ibeji, cherished first by the mother and then by the surviving child, are a distinctive form with high, conical and ribbed hairstyles and beaded jewellery. Most examples sell in three figures but these were provenanced to the private collection of the late Marvin Chasin, the American dealer, restorer and collector who settled in London. Old hands will remember Chasin from his days at Portobello Road. French dealers seemed to wake up to the ibejis the day before the sale, pressing Hobbs for condition reports and booking phone lines. They took the top-sellers. A pair of 11¼in (28.5cm) male figures, unusual and earlier than others with rather elongated faces, estimated at £400-600, made £6700. A single 10½in (26.5cm) tall female figure, with a hand to her breast, rather than the usual arms-down-by-side, went at £6500, more than 20 times the lower estimate. A South African dealer came up against unexpected opposition for a lot comprising a Turkana (Kenya) leather and beaded bag, 2ft 3in (68cm) wide, an Ndebele cache sexe (Zimbabwe/South Africa) strip of beadwork and trinkets. Estimated at £150-200, the lot sold at £3000 to an English textiles specialist after the bag – a welcome new breed of buyer, said Hobbs, as textiles are a flattish area of the tribal market. One of the biggest surprises of the day led the Oriental offerings. 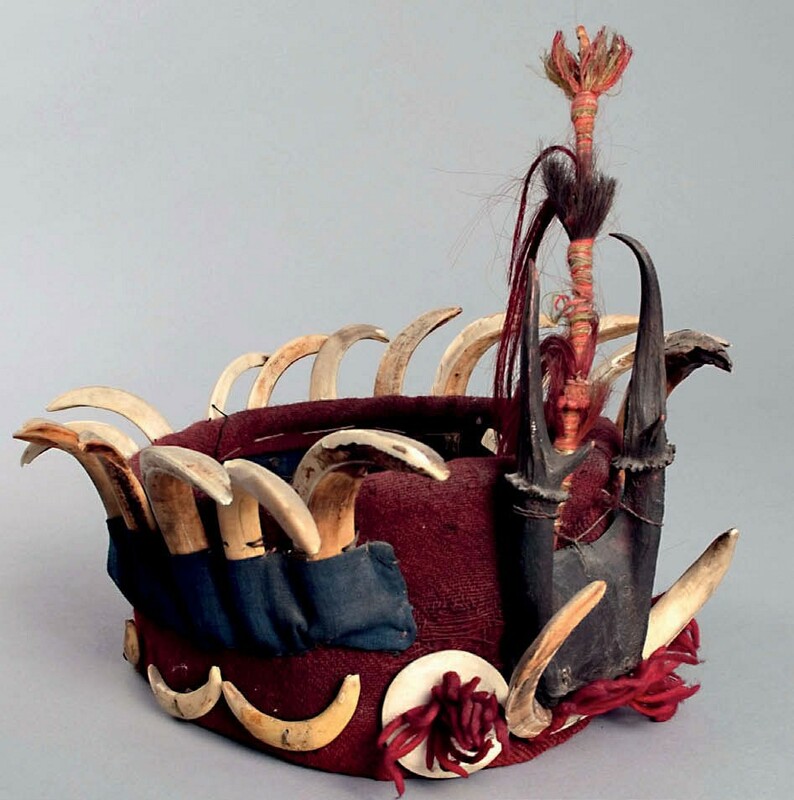 This was a cloth and horse-hair headdress incorporating boar tusks, antlers and shell disks made by one of the aboriginal peoples of Taiwan – 2% of the population today, valued rather less highly than artefacts made by their ancestors. Such pieces are rarely seen on the market. This one was part of a small collection of an English traveller who brought back pieces from his regular trips to Taipei. Estimating was a challenge. “It was in very good condition and so could either have been relatively modern or an old piece worn for one or two special occasions and carefully stored,” said Hobbs. Pitched at £200-300, the 11in (28cm) tall headdress sold to a Paris dealer at £16,000 – setting off a flurry of Twitter activity which suggested it was a world record. Western Papua and Papua New Guinea are more more familiar territory (for tribal collectors, if not world travellers). From the former came a 5ft 6in (1.7m) tall carved and painted Asmat ancestor figure. With scroll decoration, some remaining fibre decoration and white and red pigment, it went at a mid-estimate £11,000 to a Californian bidder. A Fiji cannibal fork, 10¼in (26cm) long with four tines or prongs, was pitched at £800- 1200 but sold at £3400. The fork belonged to The Methodist Missionary Society, London, from which the renowned authority James Hooper bought it in 1948 for his collection dispersed by Christie’s in 1979. “Every line of provenance in the catalogue adds a few hundred pounds to the bidding,” says Hobbs. Oceanic, possibly Tongan, club, 3ft 6in (1.06m) – £14,000. Nonetheless a lack of definitive knowledge was no hindrance to soaring bidding on ‘an Oceanic club, possibly Tonga’. With spade head and remains of an old but unhelpful label, the 3ft 6in (1.06m) long club took a Paris trade bid of £14,000 against a £600-800 estimate. “I’m not sure that either the buyer or underbidder knew exactly what it was, but it was a beautiful piece,” said Hobbs. By 9pm GMT the saleroom was almost deserted but the phone lines were still active from Down Under for the final lot. 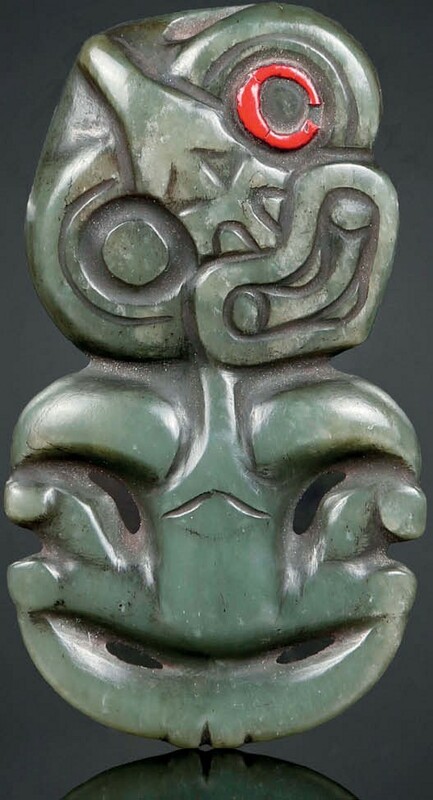 It was worth the wait: a 19th century nephrite pendant hei-tiki. These pieces representing the first man on earth (a Maori warrior) are officially taonga (treasure) in Maori culture and this 4in (10cm) example sold at £20,000 against an estimate of £4000-6000.